By the time the 1860 census returns were ready for tabulation, the nation was sinking into the American Civil War. As a result, Census Superintendent Joseph C. G. Kennedy and his staff produced only an abbreviated set of public reports, without graphic or cartographic representations. The statistics did allow the Census staff to produce a cartographic display, including preparing maps of Southern states, for Union field commanders. These maps displayed militarily vital topics, including white population, slave population, predominant agricultural products (by county), and rail and post road transportation routes. This census saw Philadelphia regain its position as second-most populous American city, which it had lost to Baltimore in 1820. Philadelphia would in turn permanently lose the position to Chicago in 1890. 1 Dwelling-houses—numbered in the order of visitation. 3 The name of every person whose usual place of abode on the first date of June 1860, was in this family. 7 Profession, Occupation, or Trade of each person, male and female, over 15 years of age. 8 Value of Estate Owned: Value of Real Estate. 9 Value of Estate Owned: Value of Personal Estate. 10 Place of Birth, Naming the State, Territory, or Country. 14 Whether deaf and dumb, blind, insane, idiotic, pauper, or convict. Full documentation for the 1860 population census, including microdata, census forms and enumerator instructions, is available from the Integrated Public Use Microdata Series (IPUMS). Aggregate data for small areas, together with compatible cartographic boundary files, can be downloaded from the National Historical Geographic Information System. National data reveals that farmers (owners and tenants) made up nearly 10% of utilized occupations. Farm laborers (wage workers) represent the next highest percent with 3.2%, followed by general laborers at 3.0%. More localized data shows that other occupations were common. In the town of Essex, Massachusetts, a large section of the women in the labor force were devoted to shoe-binding, while for men the common occupations were farming and shoe-making. This heavy demand of shoe-related labor reinforces the high demand for rigorous physical laborers in the economy, as supported by the data of very large amounts of farm related work as compared to most other labor options. IPUMS' data also notes that the share of the population that had been enrolled in school or marked as "Student" stood at 0.2%. This demonstrates a small rate of growth, if any, in the proficiency of the human capital of the time—the skill set a worker has to apply to the labor force, which can increase total output through increased efficiency. The census of 1860 was the last in which much of Southern wealth was held as slaves—still legally considered property. Analogous to today where wealth can fluctuate with value changes in stocks, factories, and other forms of property, the South suffered a huge loss of total wealth and assets when the American Civil War ended and slaves were no longer counted as physical property. ^ "1860 Census Questionnaire" (PDF). 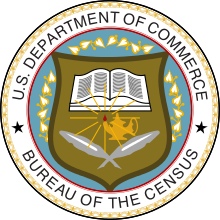 US Census Bureau. Retrieved March 28, 2013. ^ "IPUMS 1860 Census Data". IPUMS Data Collection. Retrieved March 1, 2011. ^ Wilhelm, Kurt. "Essex, MA Census 1860". 1860 Federal Census. Archived from the original on July 23, 2011. Retrieved February 27, 2011. ^ Figures recorded for Dakota Territory by the censuses of 1860, 1870, and 1880 are listed here as belonging to South Dakota..
Wikimedia Commons has media related to 1860 United States Census.